Pech Merle is a cave which opens onto a hillside at Cabrerets in the Lot département of the Occitania region in France, about 35 minutes by road east of Cahors. 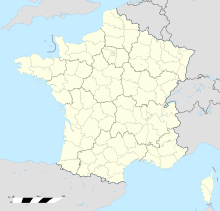 It is one of the few prehistoric cave painting sites in France that remain open to the general public. Extending for over a kilometre and a half from the entrance are caverns, the walls of which are painted with dramatic murals dating from the Gravettian culture (some 25,000 years BC). Some of the paintings and engravings, however, may date from the later Magdalenian era (16,000 years BC). This area once had a great river flowing through it, cutting underground channels which were later used by humans for shelter and eventually for mural painting. The cave art located in the deeper areas of the cave was discovered in 1922 by Marthe David, her brother Andre David and Henri Dutetre, three teenagers who had been exploring the cave for two years. Like other children of the area, these three had been encouraged and assisted in their exploration by Father Amedee Lemozi, the curate of Cabrerets and an amateur archaeologist who had discovered other cave paintings in the region. 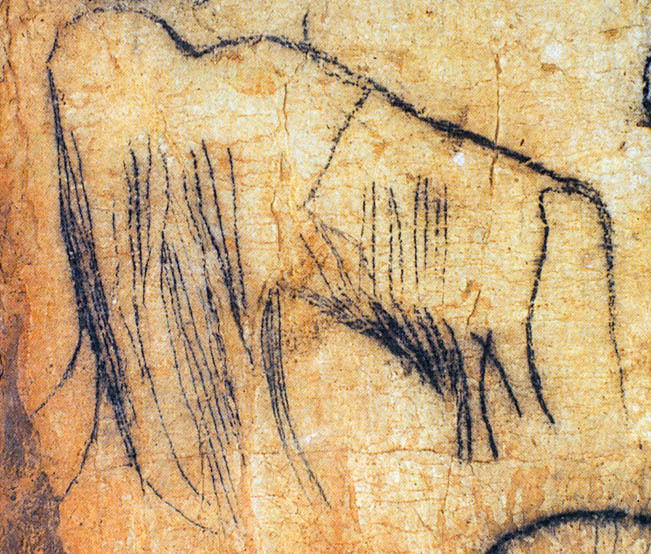 The walls of seven of the chambers at Pech Merle have fresh, lifelike images of woolly mammoth, spotted horses, single colour horses, bovids, reindeer, handprints, and some humans. Footprints of children, preserved in what was once clay, have been found more than half a mile underground. In 2013 the Tracking in Caves-project tested experience based reading of prehistoric footprints by specialised trackers of Ju/'hoansi San with great success. Within a six-mile radius of the site are ten other caves with prehistoric art of the Upper Palaeolithic period, but none of these are open to the public. During the Ice Age the caves were very probably used as places of refuge by prehistoric peoples when the area had an Arctic climate, very cold temperatures, and native animal species very different from those of the present day. It is supposed that, at some point in the past, rain and sliding earth covered the cave entrances with an airtight seal until the 20th century. Experimental reconstruction work by French archaeologist Michel Lorblanchet has suggested that the application of the paint for some of the paintings was probably by means of a delicate spitting technique. The cave at Pech Merle has been open to the public since 1926. Visiting groups are limited in size and number so as not to destroy the delicate artwork with the excessive humidity, heat and carbon dioxide produced by breathing. The paintings "Dappled Horses of Pech Merle", approximately 25,000 years old, depict spotted horses that look remarkably similar to the leopard pattern common in modern Appaloosas. Archaeologists have debated over whether the artists were painting real horses they had observed or whether the spotting had some symbolic meaning. A 2011 study using the DNA of ancient horses, however, found that the leopard complex, which is involved in leopard spotting, was present, and concluded that the cave painters most likely did see real spotted horses. ^ Lawson, Andrew J. (2012). Painted Caves: Palaeolithic Rock Art in Western Europe. Oxford: Oxford University Press. pp. 373–374. ISBN 978-0-19-969822-6. ^ "Mammoth, Pech Merle". Retrieved 2012-05-07. ^ Adams, Laurie. Art Across Time (4th ed.). Mc-Graw Hill. p. 34. ^ "'Tracking in caves': On the trail of pre-historic humans -- ScienceDaily". sciencedaily. Retrieved February 4, 2017. ^ "project – Tracking in Caves". Tracking-in-caves-online.de. Retrieved February 4, 2017. ^ Lorblanchet, Michel (1991). "Spitting images: Replicating the spotted horses of Pech Merle". Archaeology. 44 (6): 24–31. ISSN 0003-8113. ^ "In Search of Human Origins – Part Three". Nova. 17 June 1997. PBS. Transcript. Retrieved 17 May 2013. ^ "Presentation". Centre de Prehistoire du Pech Merle. Archived from the original on 27 June 2013. Retrieved 17 May 2013.